This has been a Boys in Our Books Group Challenge. "I couldn't possibly put into words what that meant to me. Nor had I realized until that moment how much of a group project it was to grow up. Each of us is just an imprint of the many people who have crossed paths with us over the years, some more times than others. Most of us never think to say thank you. I know I never had." 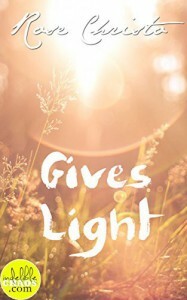 Rose Christo's "Gives Light" is like calm water. There is something soothing when you read the words, like a soft blanket, covering you, making you feel relaxed and safe. It might have to do with the setting -- everything happens inside an Indian reservation, so in a way, it makes everyone protected from the outside world. Even state laws don't apply to reservations. It might also have to do with Skylar -- being mute after a tragedy that takes away his mother's life; you are conditioned to see the world from his other senses. How he sees things, how he absorbs things, how he makes sense of what happens around him. I love Skylar ... even if sometimes he seems younger than he actually is, but his ingenuity wins him over. He is like a new gentle soul -- I love being inside his mind. I love his soundless laughter the most though. The story moves naturally, in a gentle way; never pushy, never forced. The relationship between Rafael and Skylar feels natural; the connection between them magical yet believable. While I adore Skylar for his innocence, I love Rafael for being fierce and determined and loyal ("I won't let them," Rafael said. "I won't let anyone take you away. I won't let anyone hurt you. I'll protect you. I'll always protect you. I don't care how. I just will."). There are just SO MANY FEELS in this book and I keep feeling like my heart is going up my throat. "Time, at some point, became inconsequential. Time wasn't Rafael; time didn't matter. Only Rafael mattered. Only Rafael possessed my thoughts, my every pounding pulse, euphoric and bittersweet, illogical and wonderful. For that moment, devoid of time, even I didn't exist, except for the part of me that was touching Rafael, kissing Rafael, the part of me that couldn't tell where Rafael ended and I began." I fall in love with all the characters. Even if the story is written from Sky's perspective, I can feel everyone's personality just fine. From Sky's other friends: Annie, Aubrey, Lila, Joseph ... to his Grandma (I love that woman!) to his father (when he said "Skylar," he said. "I love you," he repeated. "I love you," he said once more. "No matter who you love." -- I just MELT right there). Even Nola Red Clay, whom for a moment, makes me admire lawyers *lol*. The book is not perfect though, which is why I can only give it 4.5 stars. I admit that there are times I wish for ripples to shake up things. The problem with Sky's father, for example, I wish it has been explored more rather than being written near the end, like a rushed resolution. So yes, I get "my ripples", but I can understand why for some, this could feel boring.